How Long to Leave Canned Cat Food Out? How Long to Safely Leave Canned Cat Food Out? Cats often do not eat a full serving of their canned cat food at one sitting. Sometimes there either isn't enough time, or other times owners forget to pick up the uneaten portion. How long can you safely leave canned cat food out? The length of time you can leave canned cat food out depends on room temperature. In the summer, lacking air conditioning, leave the food out no longer than 20 minutes, maximum. Likewise, in the winter, if the heater is on, or the food is in a warm kitchen, this same 20 minutes would apply. The absolute maximum under optimum temperature would be around 30 minutes. Kittens, who should be given smaller meals more frequently, probably will finish their meal well before 15 minutes. It's better to give them only a tablespoon or two every three hours than to take a chance on spoiled food. Exposure to air also means exposure to bacteria. Keep the food storage container closed and as airtight as possible. Moisture in the food can lead to mold. Another concern is the temperature. Don’t store pet foods (even unopened bags or cans) in the garage or shed where temperatures can go above 100 degrees Fahrenheit. Most manufacturers recommend storing kibble and canned foods in a cool, dry place. The kitchen pantry or an inside closet works great. 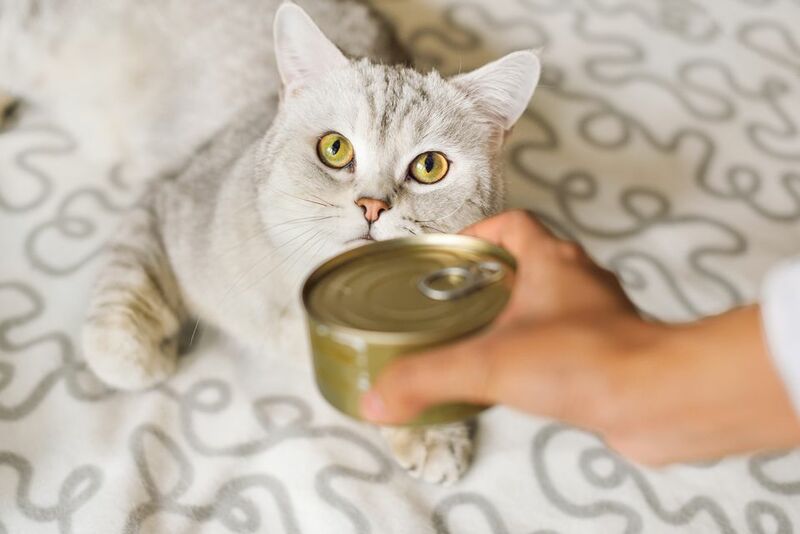 Canned food remaining in the can should be covered and refrigerated immediately after opening, and the next serving can be warmed, as most cats don't like cold food. You can use zippered disposable bags for storing uneaten food. They can be readily warmed with running water in the sink for a few minutes. An alternative would be to put the next serving in a microwavable dish, cover with plastic wrap, and warm on a low setting for a short time. The idea is to not make the food hot, but rather, warm it to room temperature. What Is Human Grade Cat Food?